NASSCOM Big Data & Analytics Summit is renowned for its participation and rich quality of discussions. This year's theme is "Democratizing AI: From Disruption to Business as Usual" where democratization is defined as the action or development of making something global. The conference will focus on the inevitable shift from being a disruptor to business-as-usual. It will address the real challenge of identifying where and how to start integrating Artificial Intelligence, Machine Learning and Deep Learning into business models. Meet the Course5 team to know how we're driving digital transformation for global organizations by leveraging analytics, insights and artificial intelligence. 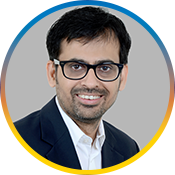 Manish has close to two decades of experience across market research and analytics. 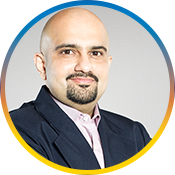 In the past decade, he has held several leadership positions with the responsibility of driving business expansion and innovative business solutions based on Artificial Intelligence and other leading technologies.